100 Spoons is inside the Rise Shopping Centre which is directly connected to Futakotamagawa. If you go during lunch time, you will see many moms with their children waiting in line. And it's not only because the resto serves free baby food! 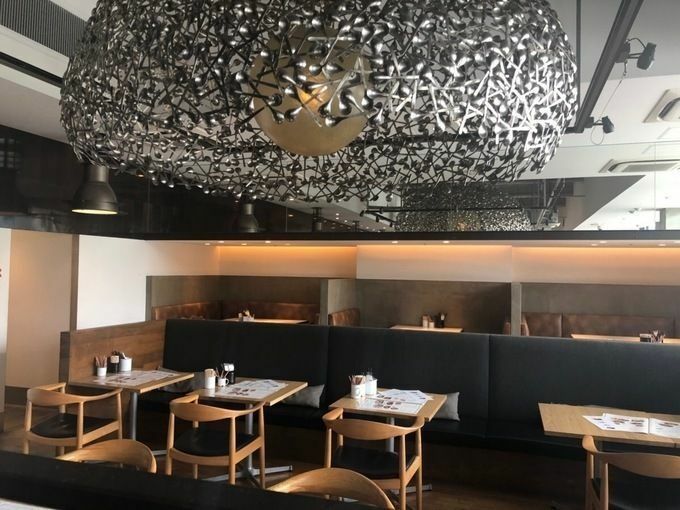 100 Spoons has an open and wide interior, and it was made to be comfortable for moms and their children. The restaurant has baby chairs and diaper changing rooms which makes it a very welcoming place for moms (or dads) to come to eat with their babies. 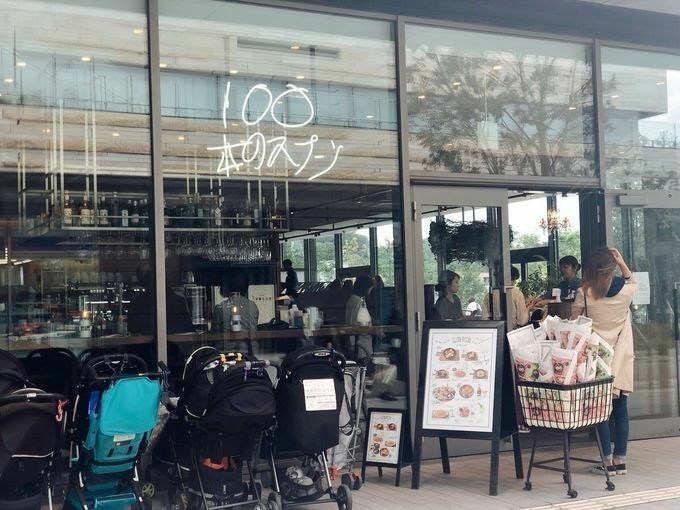 This restaurant in Futakotamagawa is said to be a prayer come true for a lot of mothers! There's free baby food and you can also get free refills! The best part is that the food provided is adapted to the children's age. The cutest "Little Big Plate"! This is the popular plate at 100 Spoons, "The Little Big Plate", ¥1,980. When the plate arrived, I was surprised at how cute and photogenic it was. There are many types of things to try on one plate and it is quite filling! There are 10 small dishes to try on one plate, such as hamburger, gratin, etc. It is the adult version of a kid's plate! You can enjoy many different types of ingredients and slowly enjoy them! Another of their popular dishes is the hamburger stew cooked in aluminium foil. There is a rich demi-glace sauce and the meat is very juicy. It's really good to dip your bread in. 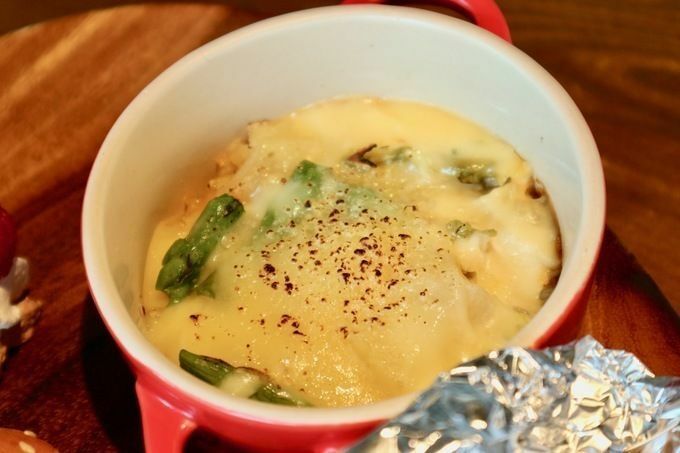 This is the asparagus gratin which is also made with seasonal vegetables. If 10 small dishes seem like a little much for you, you can also order the half size. This is a reduced portion of 6 dishes and is perfect for someone who doesn't have a big appetite. It's also very photogenic and cute! There are colouring pencils for children as well as other fun things! It's a really nice thing that kids can have free baby food and free refills! It's also really nice that the restaurant prepares many things for children not to get bored. For example, there are colouring pencils on the table for children to draw while moms enjoy the meals. The "Little Big Plate" is a great dish to try as you can try many different mini dishes and the best part is it changes seasonally so you'll never get bored of it. You don't have to be a parent to enjoy this super cute lunch plate. Be sure to try it out for yourself!